Thoughts can be divided into two categories: negative and positive. Negative thoughts tend to be hurtful or destructive. Positive thoughts tend to be helpful and constructive. All kinds of problems can be caused by negative thoughts, from negative experiences in life to disease. Viruses and even Lyme disease, hide in negative thoughts, so it can be helpful to get rid of them. If you would like to release negative thoughts and thinking, then the remedies listed here can help in various ways. If you want to get rid of viruses or other infections, then it is a good idea to release negative thoughts, because the “bugs” tend to hide in them. It is not surprising that negative thoughts may be linked to disease, when we think about the effects of negative emotions. There is evidence that negative emotions can trigger disease. For example, grief can increase the risk of cancer. The link between negative thoughts and disease is an extension of this. Negative thinking is not just linked to those who are greedy, hateful, seek power over others, or would even harm them. Instead, it can be the worries of ordinary people about work, money, relationships, security and so on. People may have doubts, fears or suspicions holding them back. They often lack positive, uplifting thoughts or find it difficult to express these. We seem to live in a particularly negative age, and the internet facilitates the spreading of negativity around. This general negativity tends to reinforce negativity in ourselves and vice versa, so this becomes a downwards spiral. The problem with negativity is that it is destructive in our outside lives, and harbours disease inside ourselves. It is thus very important to let go of the negativity within so that we can be healthier, more positive and live more constructive lives. The brain is a very logical device. If we give it a negative input (e.g. a threat), it produces a negative output. If we give it a positive input , it produces a positive output. It is important to be aware of this and release as much negativity as we can, so that we can be more positive and help others to be positive. My remedies can help with this. In physics there is order and chaos. Health is orderly, disease is random and chaotic. Consciousness collapses the wave function and determines outcomes at the atomic levels. Negative states of consciousness create disorder, whilst positive states create order and harmony. You can therefore see how infections are drawn to negative states. Viruses in particular, seem to be drawn to negative thoughts. Bacteria seem to be drawn more to a broader range of negative energies, including negative emotions - Lyme is particularly drawn to negative emotions. It therefore follows that if one could get rid of the negative energy harbouring the infection, then it would be weakened and could even go. However, in practice there is immune suppression, whereby the infection creates its own negativity to hide in. Also it may be difficult to get rid of certain negative energies. My approach is thus a multi-pronged one to eliminate the negative thoughts, emotions and energies as best one can, and also boost the immune system against the infection, especially to overcome its immune suppression. This usually has real success. Releases negative thoughts linked to viruses. Golden l;ight is the echo of the golden light of heaven. This remedy brings in golden light to release negative thoughts. Releases negative thoughts from the immune system. Releases negative thoughts loinked to etheric adamantine particles. May help Lyme disease. Helps release negative thoughts linked to negative emotions. You tenmd to create what you see. So if there are negative thoughts in your eye chakras, you are seeing the world through a cloud of negativity and tend to crwate negtively. 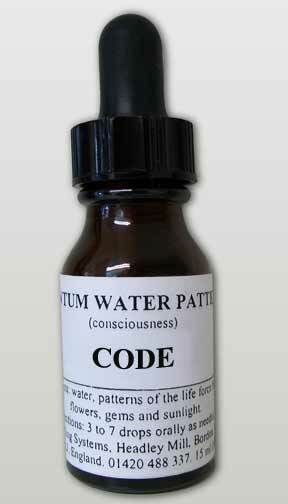 This remedies help release negative thoughts from the eye chakras.